Strong: USD, JPY. The preferred range is from 7 to 8. Average: CHF, NZD. The preferred range is from 5 to 6. Weak: EUR, GBP, AUD, CAD. The preferred range is from 1 to 4. Besides these the "12 monhts Currency Classification" chart of each currency is also consulted and compared. 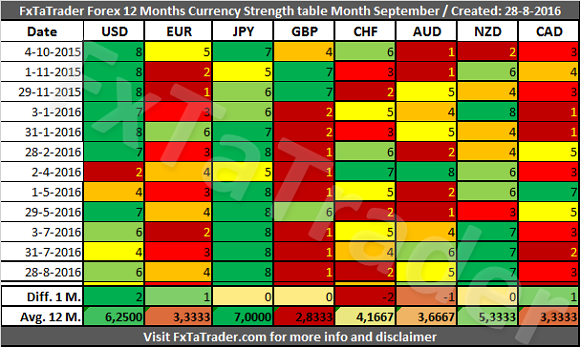 As can be seen in the "Currency Strength Table" here above the NZD has a very strong score of 7 during the last 3 months. Although it is still almost a whole point seperated from the USD, which is the strong currency, the NZD is getting closer to become a strong currency also. 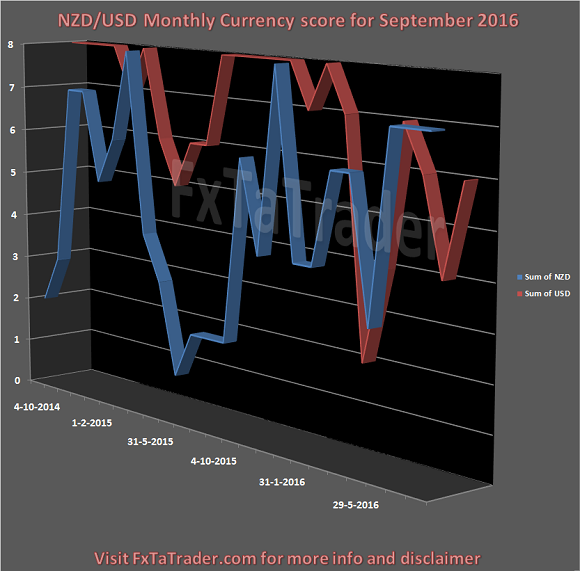 Here below you can see the Monthly Currency Score Chart with 24 months data as a reference showing the the NZD and the USD. JPY, NZD and the USD. These are strong or average currencies from a longer term perspective when looking at the last "12 months currency classification". GBP, CHF and the CAD. Some of these pairs comply for a longer term trade based on the Weekly and Monthly chart. We will look at these ones here in a bit more detail. GBP/JPY, GBP/NZD, GBP/USD, CHF/JPY, CAD/JPY, GBP/AUD, EUR/JPY and the AUD/JPY. All the pairs are mentioned as "Approved" pairs in the "Currency Comparison Table". 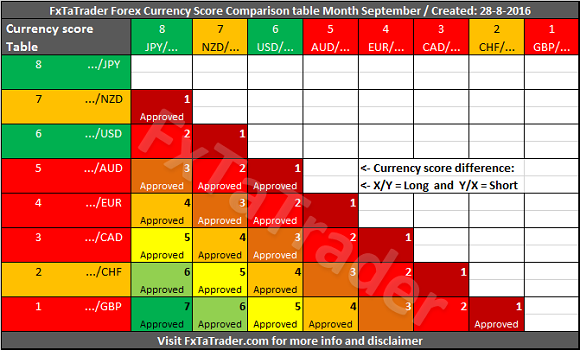 The GBP/CHF, NZD/CAD and the EUR/NZD are not mentioned in the Top 10 of the Ranking and Rating list.